Something happened yesterday that made me stop and think about this. I stopped into a local cooking school to pick up some flavored oil. It’s owned by a woman who ran a catering biz for years, and decided that she wanted to teach. It’s a pretty neat little place. During the transaction, I asked her a question about pie crust. Before I had even finished my question, she was shaking her head. “That’s not the way you do it," she said. "Here’s what you have to do…” and proceeded to tell me about her method. “But wait,” I said, “I’ve tried that, and it didn’t work.” I mentioned an example of why her method didn’t work for me. Now I should mention, my point here is not how to make a good pie crust. It’s about how to share information with others in a way that leaves them feeling good, in addition to feeling better-informed. (As you might guess, this is my goal in teaching knitting methods.) Although I have no doubt that the owner of the cooking school only wanted to help me to make better pie crust, and wanted me to feel good about that, I left feeling not good. This puzzled me. She probably knows a lot more about pie crusts than I do, and here she was giving me the benefit of her experience, for free. Why did I not come away from the exchange feeling good about it? Well, I have a theory. I suspect that any given student, no matter how well or how poorly she understands a given subject matter to begin with, will have a better learning experience if the teacher starts by listening, rather than talking. That is the kind of teacher I aspire to be. Certainly when it comes to knitting, there are so many different ways of doing the same basic thing, who am I to say there's one way to do Jeny's Surprisingly Stretchy Bindoff? Oakdryad on Ravelry figured out you can do JSSBO with a crochet hook. What a great insight, I wish I'd thought of that! I never would have guessed that in striking up a conversation about how to make pie crust, I would come away with such a rich collection of musings on the kind of teacher I want to be. 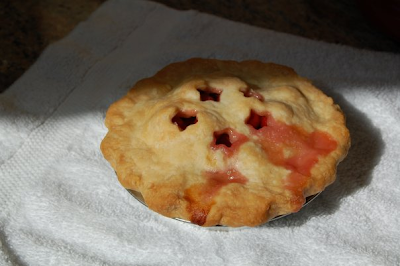 And her tips on pie crust were quite useful, too! Like many sock knitters, I too experience the phenomenon of thoroughly enjoying knitting sock #1, and then having no interest in knitting an identical sock #2. Various clever and well-meaning souls have suggested cures for this malady. There's the two-at-a-time method. Even the two-in-one method, for daredevil knitters. These and other cures may indeed help increase your chances of finishing your pair of identical socks. But they sidestep the real issue, which is: why do socks have to be identical? 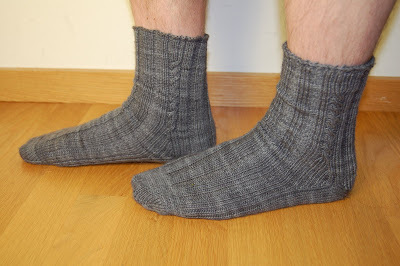 Below is a recent pair of socks modeled by their recipient, my dear husband. They look a fine pair, don't they? Well yes, that's the point. But there are, in fact, some important differences. I knit the first sock (on the left) from the cuff down. I knit the second sock (on the right) from the toe up. This proved to be an interesting exercise, a good excuse to do a few side-to-side comparisons. Below on the left is the cuff-down sock, started with stretchy slipknot cast-on. On the right is the toe-up sock, finished with Jeny's Surprisingly Stretchy Bind Off. Up close, and stretched out, here's the slipknot cast-on (left) and JSSBO (right). To offset the slight flare in JSSBO, I added some elastic thread along the top of the inside (which, now that the socks have been washed, I can see was probably unnecessary). The cuff-down sock (left) has a star heel. The toe-up sock (right) has a wedge heel. Both were knitted as afterthought heels. Either heel design would have worked starting from either the cuff or the toe. I had a little fun with the toes too. 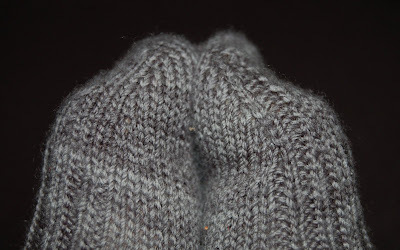 The cuff-down toe (left), the first one I knit, flows smoothly and simply across stockinette. 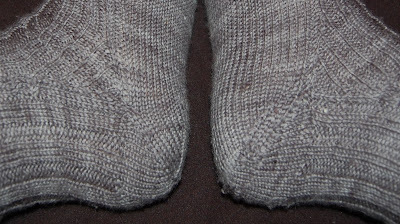 For the toe-up sock (right), I added a decorative channel of purl stitch between the increase stitches, which flowed continuously into the pattern on the foot. There are more differences still, but they get progressively more hairsplitting and difficult to show in photos. Suffice to say, the two socks look similar enough to the gift recipient to qualify as a matched pair. But at the same time, I enjoyed making the second sock just as much as I enjoyed making the first, because it was a completely fresh sock-knitting experience!